I call it, Feeling my way towards Infinity. Taking a dull, abused blade and slowly, carefully bringing it to a strange, invisible edge that can shave hair like a barber and slice through meat like butter. The final product is a knife that demands respect. The edge of the blade is mirror smooth, without the common saw tooth that most knife sharpeners produce. This fine clean line will cut like a razor and does not dull as fast as a common edge. The superior convex character of the completed knife is geometrically more stable that the more common concave edge, removes less metal and is less likely to chip, crack, or bend. 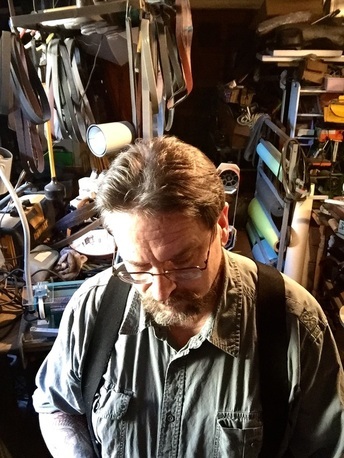 Good Knife Sharpening is not only a skill, but a kind of art form. Your Knife sharpener should not only know knives, but also understand the people who use them how they will be handled. 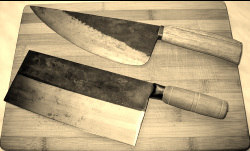 Just like a Samurai's sword was called his soul, for a good cook, their knives take on a deep meaning. Proud to be a guest Knife Sharpening Instructor and Consultant for Gerber Legendary Blades in Portland. It's an Honorable Company with a quality product and I was thrilled to be invited to participate! I will bring your Knives to a Razor Edge for an extremely reasonable price. 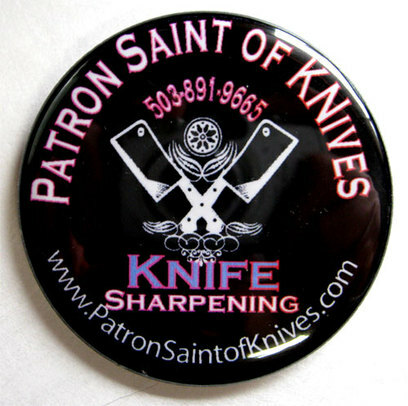 Due to increased business pressure, it is difficult to do pick ups, however, if you are housebound or have a large number of knives, we can work something out for the central Vancouver area ($1. per knife surcharge). It's easy to drop your knives off at my house in the Knife Locker System out front and then pick them up when I let you know they are done. Generally there is a 24 to 48 hour turn around. That's $5 a blade, if we arrange for me to pick up, it's $6 a blade. In Portland, during the Spring and Summer while I'm going to Yard Sales, I can usually pick up on Saturday and will return them the next Saturday for 10 or more knives. Now that Excalibur Cutlery and Gifts has gone out of business, I would like to welcome all of their ex-customers to have their knives sharpened here. They were a nice store, but they didn't know how to sharpen knives worth a hoot! Consider Friending Me on FaceBook! How to Sharpen Serrated Knives! 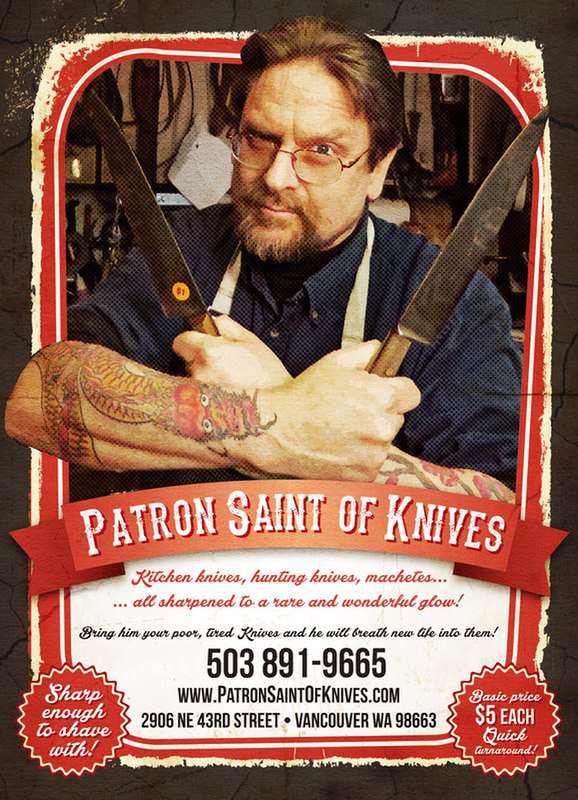 Preacher Dude Gives The Patron Saint of Knives a Plug!